This is my performer Fin. It’s a fin I designed and what is used with the Threedom model. After many years of riding different fin models, my quest and research into an all- in -one fin had to arise … thus, the Performer Fin was Born. Kinda like a Hot sauce that has all right ingredients, not too hot… not too mild… Just the right amount of drive, arch, and release is the taste test after all. These fin’s are designed for 2+1 or single fins for short or longboards. They are available an in stock at True Ames fin co. in Goleta ca. Here’s what True Ames recently said about my fin.The foundation of this design is competition & high performance 2+1 longboard surfing. 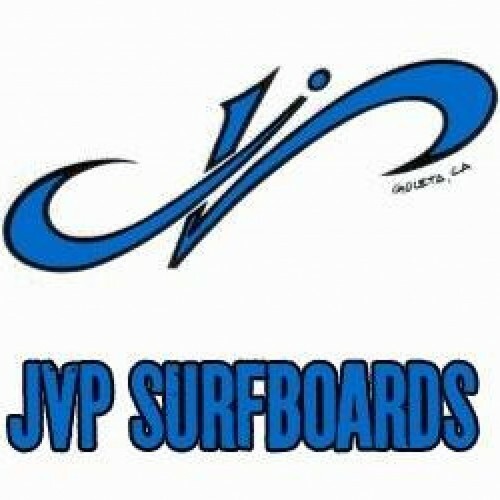 John Perry, one of Santa Barbara’s most notable long time shapers, has lent his hand in fine-tuning these gems, most recently. A powerful, full base fin, with an extremely smooth ride. SMALLER SIZES ( 5.45” – 6.25” ) Pair up with a larger set of side bites for a great combo. 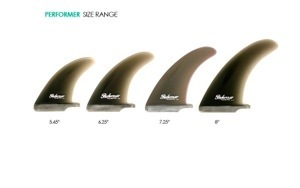 LARGER SIZES ( 7.25” – 8”) Try these out as a single fin setup. After many years of riding different fin models, my quest and research into an all- in -one fin had to arise …, thus the Performer Fin was Born. Kinda like a Hot sauce that has all right ingredients, not to hot… not to mild… Just the right amount of drive, arch, and release is the taste test after all. 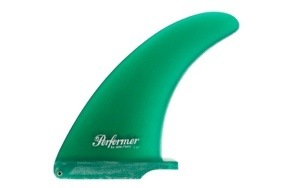 These fin’s are designed for 2+1 or single fins for short or longboards. They are available an in stock at True Ames fin co. in Goleta ca.